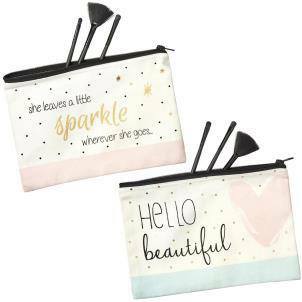 We loves these fabulous little make up bags! Ideal for storing your brushes and cosmetics! A lovely gift for that lovely friend! Please note that price is per bag and that brushes are not included. Please select which bag you would like to purchase from the drop down menu above. Bag 1 - "She leaves a little sparkle wherever she goes"
Bag 2 - "Hello Beautiful"